Giving and receiving are arguably the best parts of the holidays. It feels just as good to give out gifts or warm wishes than it is to receive them! 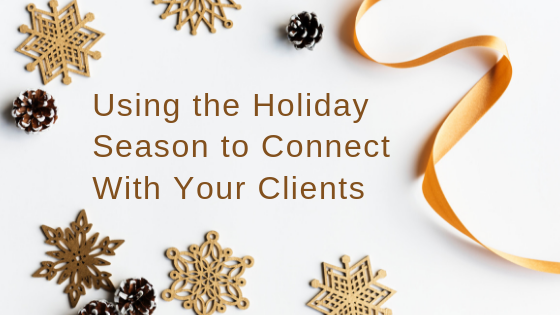 There are many ways you can use the holiday season to connect with your current or potential clients. You can send them a virtual holiday card (saving trees is also important🎄) to remind them that you care, or if you have an online booking platform, you can add a seasonal message on your homepage, emails or automatic appointment reminders you send, wishing them happy holidays and warm wishes. You can even play Santa and offer your clients seasonal discounts as token cards that you can put up on your site or make available online through your booking platform. Topped off with exclusive products and limited services for the holiday season, this will allow you to spoil your clients! Who knows, it might even help turn potential clients into paying customers. In any case, just make sure to be creative and personalize your offers in order to stand out in the face of competition. If you run a small business and want to add a personalized touch to your holiday greetings, you can even give your clients a phone call. This can make the experience more personal, especially when all their other service providers send out generic emails and holiday cards. If you really want to stand out in the eyes of your clients, that could be the way to go! Regardless of what you choose, just make sure to be unique in your process so that your clients feel special and valued. If you have different social media pages, make sure to include your clients in your celebrations through them. Share all the fun and glamorous pictures of your company holiday party, whether it is a tight-knit office party or a fancy celebration at your favorite restaurant. Humanize both yourself and your business by showing your clients you are just like them, you also love to wear your favorite ugly Christmas sweater and drink eggnog! Again, you can also make the experience more personal for your clients by throwing a big holiday event and inviting all of them. This can be a great way to boost your employees’ team spirit and show your current clients that you treasure and reward their loyalty. If you and your employees don’t often interact or have never interacted with your clients in real life, this can be a great opportunity to put a face to their name and get to know them better. Who knows, your clients might even interact with each other, share similar fields of activity, and your holiday party could turn into a great networking event! All in all, the holidays call for proper celebrations, and why not include your clients in those celebrations? After all, they’re the ones that are most loyal to your practice and allow you to do what you love every day, and for that, they should be probably thanked and rewarded. The holidays seem like an appropriate time to ask for your clients’ feedback and all the suggestions they have for the services you offer. If you use an all-in-one online booking and scheduling platform, you can generate surveys that are sent out to your clients right after their appointments with you or one of your employees. Make sure to ask them how satisfied they are with your services, but also how they think you can improve them. This will remind your clients that you care about their suggestions and ideas, and that your main goal is to continuously refine your services to properly accommodate their needs and wishes. And what better time to show your clients that you care about them and their opinion than during this festive, holiday season. This will strengthen your clients’ trust and loyalty and ensure an ongoing use of your services.